‘War’ what is it good for? Well perspective for one…. One thing I try to be pretty open about is the fact that I suffer with depression. It’s something that I’ve been struggling with for a long time, at times it’s bled into my personal life and there’s been moments when I’ve not been a nice person. I’m doing better these days thanks to medication. So… How does this fit in with this article? Exposition mainly. Last year I was in a pretty bad place. I had absolutely no motivation because of how I was feeling and spent a lot of time just on my PC. This led me to feel guilty about how I wasn’t doing anything, which made things worse. That was until I heard the song ‘War’ by Sum 41. Looking for new music, I started listening to Kerrang radio while I was gaming. It was during this time that I heard that Sum 41 were due to release a new album. 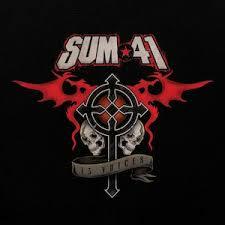 I admit I’d not listened to Sum 41 in a few years. It was surprising to me to hear they were still going. I thought nothing more of it except that I’d buy the new album when it launched. Later on I heard the song ‘War’ on Kerrang Radio. At first I didn’t realise that it was Sum 41 but something about the song resonated with me. The song talks about fighting to get your life back by declaring war on your problems and defeating them so you can live your life. That’s the way I interpreted the lyrics. This made me look at my life as it was and decide that I wanted to do something about it. This website is a result of that song in a way, after a lot of searching for something I decided to start this website. It’s been a long journey to this point of actually starting this site, I’ve been job hunting for a while, wanting to do something in media production. This website is the next best thing, I can work for myself and write whatever takes my interest and it’s all thanks to a song. Has any song had an impact on your life in anyway? Let me know in the comments! I saw you tweeting about gaming and I thought I’d check out your website. I really like it. Looks like Matthew has come a long way! I’ve been meaning to look at a getting an email list but haven’t got around to. Thanks for the recommendation I’ll take a look.